The ESL Program Review helped to draw attention to and confirmed that adolescent and young adult students from refugee, war-affected, and disrupted schooling backgrounds are likely to face significant challenges that often limit their opportunities for educational success and life chances. In spring of 2004, the Department sought to gather current and meaningful information on the school experiences of adolescent and young adult students with ESL needs and from refuge/war-affected backgrounds that had experienced significant disruptions in their schooling by undertaking a survey of Grades 7 to 12 schools and conducting site interviews. The survey and site interviews were designed to obtain information on the numbers of such learners currently in our schools, to develop a better understanding of their experiences and the programming models and supports currently available, and to explore the possibilities for enhancing programming effectiveness. This study was undertaken by Manitoba Education, Citizenship and Youth, in collaboration with Manitoba Labour and Immigration, and Manitoba Advanced Education and Training. A preliminary report, Building Hope: Appropriate Programming for Adolescent and Young Adult Newcomers of War-Affected Backgrounds and Manitoba Schools, summarized the results of the research. 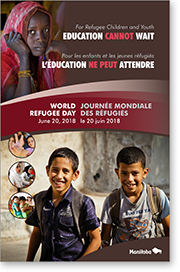 The report was the basis of a provincial consultation/symposium, There is Hope: A provincial symposium on Meeting the Needs of Adolescent and Young Adult Refugee Students with War-Affected / Disrupted Schooling Backgrounds. Ongoing dialogue and collaborative efforts with other government departments, school divisions, adult learning centres, immigrant and refugee serving agencies and other educational partners have been improving and supporting effective programming for newcomer adolescent and young adults from war-affected and disrupted schooling backgrounds.